The Over/Under exhibition marks SP01’s US debut, and L&G Studio’s first interiors project. The two were brought together by furniture maker Modern Principle, which represents both businesses. L&G Studio was responsible for designing the space in New York’s Soho, which is intended to be “part showroom, part stage set, and part public space”. “With this project, we’ve expanded our creative vision beyond individual objects and into the entire experience,” said L&G Studio co-founder Jean Lee. The lighting’s blackened brass frames suspend extremely thin aluminium disks, which act as reflectors for the LEDs. Pendant and floor versions are available. “Float implores combinations of the least, most essential elements working in concert to intimately define space with light and form,” said the studio. Some of the studio’s earlier lighting designs also form part of the exhibition, like the Shape Up collection for Roll & Hill, comprising strings of different-shaped pendants, and the Equalizer models with blown-glass spheres. 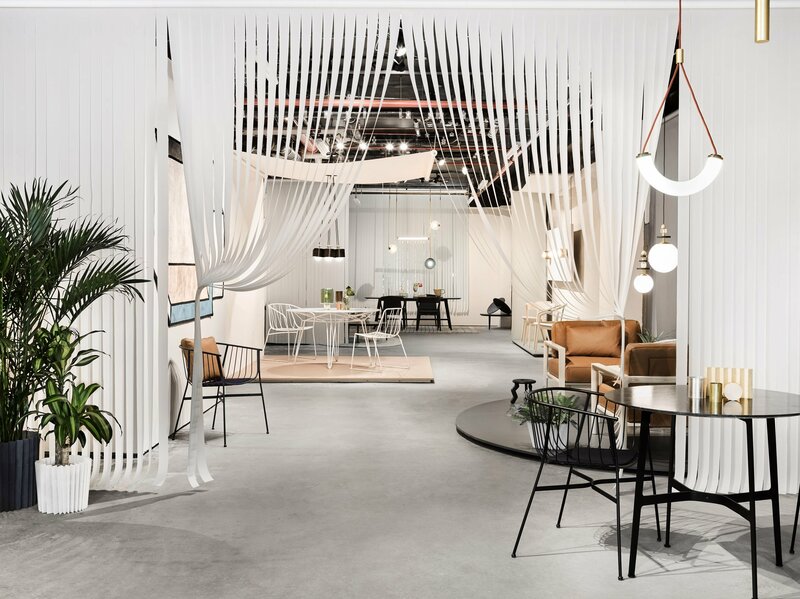 “We looked to L&G Studio to design an experience beyond the traditional showroom – a destination where guests can relax into our pieces, which are designed with urban life in mind,” said SP01 head of design and product development Matt Lorrain. The post Soft-toned installation combines designs by Ladies & Gentlemen and SP01 appeared first on Dezeen.